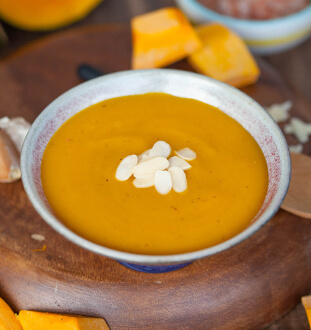 Inspired by fond memories of my Aussie boarding school days, this humble pumpkin soup recipe reminds me of Sunday roast dinners that included lots of roasted root. Indeed, nothing beats a good bowl of comforting roasted pumpkin soup. Blended with tart Granny Smith apples with only dashes of a blend of spices, it hints of sweetness and richness with the spices uplifting the soup with warmth. Vegetable stock (water, root vegetables, herbs), roasted pumpkin, onions, Granny Smith apples, garlic, vegetable oil, salt, sugar, herbs and spices.